We can all recognise formal and informal texts, but you may not know that it has a name. It is called ‘Register’. The scales of register are generally classified as Formal, Neutral, Informal and Vulgar. In this sense, vulgar refers to childish or common utterances and not rude jokes. 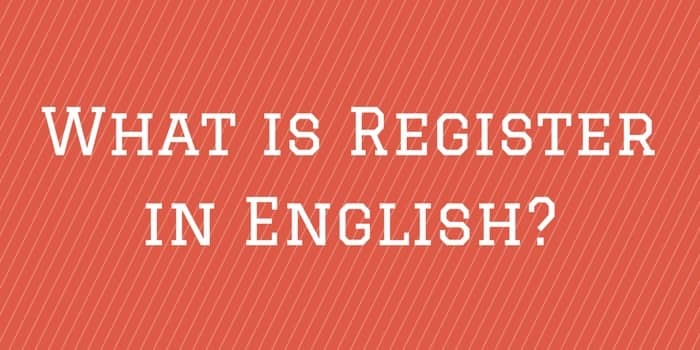 So, what is register and how can it be defined? Here are two example letters. 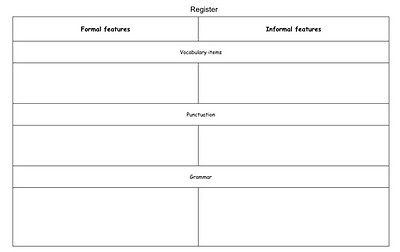 Very easy to tell formal from informal, but what are the language forms that make the difference? I will give you a few clues. Grammar, Vocabulary and Punctuation are the three areas of difference. Use the table on the right to try and find the lexical areas of difference. Thank you for your letter received 14 September 2002. A copy has been sent to company headquarters in addition to a memorandum concerning your financial situation. A meeting has been scheduled for 3 October 2002 at 11 am to discuss your request for a further bank loan. Therefore please inform us of your availability for this meeting at the earliest opportunity. However, a number of issues concerning your income and expenditure may be queried prior to a loan being granted. Furthermore the General Manager needs to be contacted in order to authorise bank loans of this nature. Moreover, your previous failure to meet payment arrangements will first have to be considered. Nevertheless, in the interim you are required to complete the enclosed business plan, which should be brought to the meeting. Thanks for your letter. I got it 14 Sept. I’ve sent a copy to comp. H.Q. along with a memo re. your financial situation. I’ve set a meeting for 3 Oct at 11am to talk about another bank loan. So, please let us know if you can make it a.s.a.p. But, we might ask you a few things to do with your inc. and exp. before giving you a loan. Also, I need to get in touch with the G.M. to okay it. Plus, we’ll first have to think about the last time you didn’t keep up with your payments. Anyway, in the meantime, you need to fill in this business plan. Bring it to the meeting with you. Good luck! If you get desperate, you can find the answer to what is register here. If you would like to download the complete lesson on Register in English, you can find it here on my ESL website.